RedCritter Corp., today announced immediate availability of its enterprise gamification employee engagement solution for Microsoft Outlook 2013 and Microsoft Office 365. This new solution promotes and surfaces peer-to-peer accolades and real-world professional achievements directly in the inbox. "Peer-to-peer recognition is a key driver for maximizing employee engagement and performance. Now everyone can send accolades quickly without leaving their inbox. This streamlined, in context, capability allows employees to remain focused on the task at hand while maximizing the chances that others' great work won't go unnoticed." 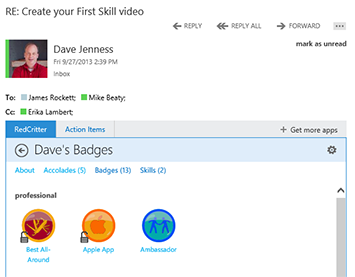 RedCritter for Outlook provides full views of any email sender's professional accomplishments including badges, certifications, skill levels and peer-to-peer accolades. Additionally accolades can be sent to co-workers, vendors and partners in just two clicks without ever leaving the inbox. RedCritter for Outlook and Office 365 is included with every RedCritter Connecter account and is immediately available. Download it from the Microsoft Office App store.